No comment, just a question: What does “outside the bounds of institutional religion” mean? Thanks. Institutional religion for the most part has a lot of structure with rules, insider information, positional leadership (as opposed to leadership that is recognized by character), special lingo, and lots of extra “stuff” on top of their belief systems. Christianity, at least here in the west but for the most part since the time of Constantine, has been no exception. What is called Christianity in our culture is often just another religion with its structure, hierarchical authority, and external rules that have nothing to do with a heart filled with love. We, like tens of thousands of others if not more, are living our faith out in our lives, but outside the structure of an institutional expression of religion. I was thinking about the “fallen angel” narrative, and it occurred to me that the main lesson supposedly to be learned from this narrative is one of authoritarianism and intimidation- you can be close to God, but don’t rebel, or you’ll be booted out and punished for all eternity. This is an awful narrative, and not a picture I recognize as Jesus-like. I am digging this conversation. I have worked 25 years in the mental health and substance abuse field. I have a two Master’s degrees, one in religious education and another in counseling. I have a license as a chemical dependency counselor. For the entire time I have worked in the MH and CD field, I have had increments of sobriety (4 months, 9 1/2 years, 10 1/2 years, 3 months, and now over 2 years) and this is the first time I have had a mind open enough to consider that my religious beliefs and my counseling education have played a large part in my inability to maintain contented sobriety. I have found a small sub-group of recovery that is discovering what the earliest members of Alcoholics Anonymous were trying to get at. I believe that the founders of Alcoholics Anonymous were the earliest radicals and mystics of the Christian faith. They were open minded to a new experience. Rigid beliefs have been a barrier to any growth for me. 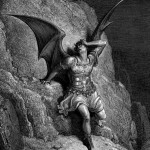 Your discussion about the satan and the demonic make sense in my spirit, and in my experience. I sat and had an individual try to cast a demon out of me one time. (It must not have worked because my behaviors didn’t change.) My experience in recovery from alcoholism this time has led me to doing morning quiet times, and reading Richard Rohr, Brennan Manning, Emmet Fox, Oxford Group and AA materials. As my son is an electrical engineer student, and teaching physics, we have had some interesting conversations regarding Quantum physics and their insight into the connectedness of everything. The greatest demon in my life has been my ego defending my frail personality belief structures. Spending time each day with God and learning to meditate and listen for his guidance have led me to conversations like the one you guys are having. I appreciate your insight, thoughts, honesty and candor in discussing a potentially volatile issue such as this. Thank you to “Beyond the Box” for sharing this! First, I want to thank you so much for Beyond the Box. I am just loving listening to each episode, in an effort to understand different perspectives regarding how one can worship Christ. This particular episode, however, was pretty frustrating. I enjoyed the philosophy, the theology, etc, despite at times not agreeing with it. But the palpable hypocrisy was dumbfounding. Brad tried to point it out early in the conversation, but Michael more or less brushed it off. If accusing others of evil IS evil, if it makes one the satan, then wasn’t much of this episode satantic? I heard what seems hard to misidentify as glee in Michael’s voice whenever he “took things further” and dropped someone’s name like a bomb, calling them demon-possessed or Satanic. But, isn’t he just accusing others, simply because they accuse? Or is it somehow different, because, after all (as he noted), HE is speaking truth. Come on.. isn’t that what the people he is calling out as evil think they are doing: using what they are convinced is a reasonable reading of Scripture to “name things what they are” even if that name is “sinful”? It’s hard to ignore the similarity to postmodernists who say that “the (absolute ;-)) truth is that there is no truth”, or political correctionists who say “there is no evil but intolerance”, or atheists who reject moral realism but waste their breath on treatises decrying some theist’s moral code as immoral! I understand the desire to undermine what many consider to be oppression flowing outward from within the walls of Christendom. But all such efforts that rely on merely judging those who judge, are doomed to self-stultifying failure. Evil exists, and we are to name it. I don’t see how one can wield the “accusor” trump card like a weapon, and yet still remain consistent. All that said, I enjoyed each of the participants’ contributions tremendously and applaud them in their willingness to riff on this. This podcast was the first Beyond the Box podcast I have listened to. It was amazing! I will be back for more. For the last ten years I have been really questioning the prevalence of dualism in our culture, the inerrancy of scripture, our understanding of the Trinity, the lack of true community in the Protestant world, to name a few issues. This podcast is exciting and scary. I find myself feeling hopeful, feeling as if my relationship with Jesus might finally be finding new life. This podcast was so full of “meat” that I will need to listen to it more than once. Thank you for sharing the journey you are on. If our faith can’t handle some probing questions, is it faith? I will definately be back for more. Thank you.